July 27 (UPI) — As the United States accepted what is presumed to be the remains of 55 U.S. service members killed during the Korean War, Defense Secretary James Mattis said Friday he would consider sending military teams to North Korea to search for the bodies of thousands of U.S. troops believed to be missing there. Mattis told reporters at the Pentagon on Friday the next step in searching for and bringing home the other remains could happen if relations between Pyongyang and Washington improve. Joint U.S. and North Korean efforts to discover the remains of more than 5,000 U.S. troops believed to be in North Korea ended in 2005. Mattis cited President Donald Trump and North Korean leader Kim Jong Un‘s summit in June for warming relations between the two countries — allowing for a continued search for remains. “So all of that went well and I think when you have that sort of communication going on it sets a positive environment, a positive tone, for other things, more important things in terms of international diplomacy, but this humanitarian act is obviously a step in the right direction,” Mattis said. 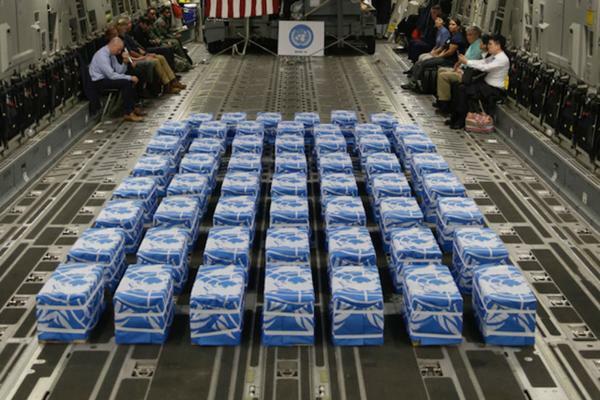 The defense secretary spoke Friday as 55 wooden crates holding remains believed to be those of U.S. troops arrived at Osan Air Base in South Korea. The transfer took place on the 65th anniversary of the signing of the armistice that ended the Korean War. The remains will be transported to a forensics lab in Hawaii to be identified, a process which may take months. More than 36,000 U.S. troops died in the war and 7,702 are missing in action, including 5,300 believed to be missing in North Korea, according to the State Department. Tagged find, Korea, more, North, Pentagon, remains, send, teams, U.S.